Where do you start on writing a sermon? Unless beginners have been exposed to good models of preaching, they are often unsure about what to do and how to do it. This book is not meant to cover every aspect of preaching. It is a manual for beginners, drawing on the author's many years' experience both in training and in ministry. Starting from the underlying principles, this book goes on to analyse the process of preaching (discovering and digesting, designing, defining and delivering) and then ways of assessing progress. Each chapter begins with a selection of quotations - sometimes amusing, always thought-provoking, which help engage the reader in the issues. Many otherwise good books on preaching concentrate on spelling out the principles, wrongly assuming that the practice will then take care of itself. This is not just a textbook on the theory, but a guidebook that gives plenty of detail about the practice as well. By the time you finish it you should be well on the way to behaving as every preacher should, instinctively reaching out for the clearest, simplest ways of communicating the Bible's message. Allan Chapple has pastored churches in Western Australia and England, has taught at the Seminari Theoloji Malaysia, and has served as Perth staffworker for the Australian Fellowship of Evangelical Students. He was the founding Director of the Perth Centre for Applied Christian Studies, and then founding Principal of Trinity Theological College, where he now serves as senior lecturer in New Testament. 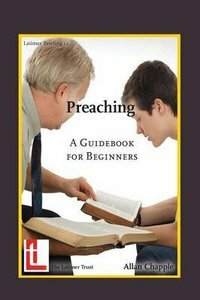 About "Preaching: A Guidebook For Beginners"
Customer Reviews For "Preaching: A Guidebook For Beginners"
This book is so helpful for those starting out in preaching because it manages to clearly articulate the process for preparing a sermon, rather than simply describing what the finished product should be like. The section on 'designing' talk outlines is exceptional and nothing has helped me more in trying to shape talks that are clear and memorable. A great book for those beginning in preaching, those looking to sharpen their approach to sermon writing or pastors wanting to clearly train others in this essential ministry.